The young competitor was sick to his stomach. He made a last dash to the bathroom before his name was called. Here he was, a newly promoted black belt at one of the biggest tournaments in the US, fighting an even bigger name - an ex-serviceman with an impressive record who had started his training in Korea. "Don't worry, you'll do just fine", his adversary promised with compassion rarely displayed at a karate event. Many people come to the martial arts because they abhor the idea of fighting, and simply want to learn some practical self defense. "I hate sparring" is actually a fairly common utterance in some schools. Part of this is due to the fact that kumite is taken personally by certain players who feel a need to prove their dominance over others. The stock warning issued by one instructor I used to know - "lighten up or I'll show you how hard I hit" - only served to reinforce the macho tendencies that were already well established. I've seen a number of decent students leave karate because of runaway sparring matches and indifferent coaching practices. Although anything can happen on the street , there has to be some semblance of fairness in the dojo. The body is constantly eavesdropping on our thoughts and responds accordingly. Fear is negative energy that takes its toll on us physically; its debilitating effect produces fatigue. Another by-product of fear is shallow, labored breathing. While emotions do affect the quality of respiration, the opposite is also true: proper breathing can re-stabilize our emotions. Taking a slow, deep breath to calm the nerves before sparring or testing can be very effective. Legendary boxing coach Ray Arcel once noted that no matter how confident a fighter may appear before a bout, there is still some remnant of fear beneath the image of toughness. As for our nervous karate fighter at the big tournament - he ended up winning after all! And it would be the last time Chuck Norris would give friendly advice to someone he was about to do battle with. Never underestimate anyone, including and especially the fearful. The thing is, in any stressful situation, keeping a calm mind; a level head. Not just in violent situations (I've had a few of those), but in emergencies of any sort, I've learned to keep my mind calm, ask questions, and explore options. I've learned to respond, rather than react. This is a very good post. I have lost count of the number of people that walk into an Aikido dojo specifically because they "don't want to fight." I am quick (but polite) to point out that self-defense is useless if you are afraid to fight. You can choose how you want to deal with a conflict--there are many options--but a student will have to face their fears whether they are sparring or attempting their first kotegaeshi. I expected to be afraid to fight. The first few times I walked into a dojo, I was entirely afraid I was going to fall apart in a "real" fight. I didn't consider the kind of light fighting I was doing as a raw white belt to be real. From that point of view, the poorly controlled shodan who put a knee in my face in week six, did me a huge favor. I found out then and there that getting hurt wasn't nearly the terror that I thought it was, and I haven't had that same problem since. I understand your point. I'm one of those guilty of claiming, "I hate sparring", but I think it's a little bit of what you are talking about...trying to show your superiority in the ring. It applies to gals too! Naturally, I don't like to lose if I can help it! I think the other part of it is really reflective on myself, in that I know that my skills are not that good, and I don't have the speed, agility or experience to do well to do as well as *I* could possibly be. Some of that comes with experience, and some of that will come if I ever lose 50 lbs and become more flexible. This session, all sparring will be done with bogu. I can't wait! I think there are 2 different subjects being discussed here. The first is the nerves that go hand in hand with competition, (perhaps more intense with combat sports)and the second is the fear, or anxiety associated with sparring. In my school, about 25% of my students compete, but 100% of them spar. When I first started Taekwondo in 1983, there was not much in the way sparring drills. We practiced a few kicks, hit some shields, then suited up and did our learning in the ring. Over the past 25 years, with the increase in competitive martial arts, (Olympic Status for Taekwondo, Karate is recognized by the USOC etc) a much more scientific approach has been applied to sparring. We actually have a sparring curriculum, where the basics are drilled to the point that the anxiety level for the students is lower because they have performed several reps of common exchanges before actually suiting up. I still get butterflies every time I go on the floor to spar. This seems normal at least from my perspective. I talk with other black belts of various ranks and most will admit they get the same when sparring. It doesn't matter the rank either as I get them with new students, experienced students, students I know and have sparred with before and students that visit the dojo. I decided to spar with a Ik-kyu going for his Sho-dan and found my hands cold and breathing shallow. I felt the butterflies. I stared slow deep rythmic diaphramic breathing and when time came I still had butterflies yet my mind was calm. I then put myself into mushin. I thought of only that moment, from moment to moment. All was balanced and working as it should. This is the way it goes every single time. Easier said than done for most people, Rick. I think it all comes down to how we interpret stress. One person's emergency is another's annoyance. ...a student will have to face their fears whether they are sparring or attempting their first kotegaeshi. 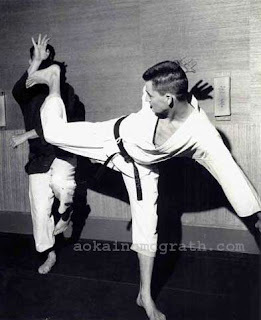 Facing something - anything - requires awareness, which is really key in the martial arts. It's funny how the things we don't want to face produce the most fear, e.g. fear of the unknown. ...the poorly controlled shodan who put a knee in my face in week six, did me a huge favor. Knee in the face? A little thaiboxing creeping into your Isshinryu regimen, eh PB? As I mentioned to Rick, your interpretation was key here - for you, this was a learning experience that you found to be valuable. Somebody else would've ran out of the dojo! As you found out, the idea of getting hurt can be worse than the actual event itself. At least it hasn't happened again! ...trying to show your superiority in the ring. It applies to gals too! Egad! Actually, my experience is that the presence of women tends to bring a tranquilizing effect to the dojo. But that's me. A woman used to come to train at our Isshinryu club - she was a 4th dan in TKD - would tell us stories about how aggresive and tough the women competitors were at high level TKD tournaments in the NY area. And breathing...well, when you are asthmatic, and learning how to not tense up during a sparring match, learning to breathe is important! I've seen reports of asthma sufferers who benefit from a deep breathing practice - to the point that their daily dosage of medication (bronchodilators or inhalers) was either significantly reduced or no longer needed. That's not a chin under Chuck Norris' beard, it's another fist! Post a photo with the bogu! I'll be checking in. ...a much more scientific approach has been applied to sparring. ...understanding that they are participating in a "match" rather then a "fight" is the key to them enjoying sparring rather then hating it. That's clever. I imagine the word "fight" could send the wrong subliminal messages to the unconscious. Thanks for your input, Gordon. An old boxing term for a guy like that is "hungry" - this is what Hanshi McGrath was talking about when he watched the brown belts spar way back when. Fear or no fear, ikkyu brown belts are on a mission! Excellent post and comments. I also get "butterflies" before competing, or before sparring someone new. Long ago, I learned that after the first contact, good or bad, my training takes over, then it's fun. I really liked how you surprised the reader of this post with the knowledge that it was Chuck Norris at the end like that. Well done. As for the "fear of fighting".. I believe that the fear stems from all of our imagined potential pain rather than from reality. I found that if I focused more on the "now" than on what might be I was much less afraid to face the challenges presented before me. My instructors always say that women are worse when it comes to the lack of control and revenge aspect that can creep into sparring. As for the breathing, you're exactly right about that. That's how I gave birth twice without an epidural. It's very calming if you do it right. I like the idea of a match instead of a fight for sparring!! At our dojo, the senseïs always say to us, when we do some pratice sparring, "Let's do some controled sparring!" I like sparring, cuz I found it the place that help me improve more, cuz I really see what are my weaker point there!! but every partner that I had was respectfull!! But at the end we have to remember that it's all done in respect for the art and the others!! I have a slightly different take on this. There was a time when I would be semi-contact/full-contact sparring (sometimes up to 1.5 hours) about 4-5 times a week, in addition to 'lighter' martial arts training. Once you get used to that frequency, and your pain threshold increases, the butterflies really decrease drastically. To the point where if you're at a 'normal' martial arts class, you find yourself really relaxing and in fact 'playing' with people who aren't as skilled. The perspective is that sparring really is quite controlled ... it shouldn't really provoke that much fear once you know that you're in a controlled environment. No one's going to pull out a weapon on you or gang up. As for myself now, I also have a sparring curriculum like Gordon White. It takes into account general skill level and the difficulty in learning how to engage the opponent. I won't call it 'scientific' though (I don't use a scientific method to manage it), but it is working really well on my group. My first experience in sparring was with a Muay Thai boxer who was also the instructor of my Jeet Kune Do class. Even though it was a slow pace sparring round, the fear of getting hit just froze me up. Once you get past that fear of being hurt, their is the fear of loosing, the fear of looking silly, the fear of the unknown, the fear of the ridicule... Is it really the fear of fighting? In that moment of truth in a life and death situation, will we be afraid to fight our enemy? I think the best advice I got is from my 6 year old son. When he's sparring, he thinks about only 2 things: not getting hit and hit back. Forget the rest. Children have this carelessness that can be a plus in sparring like in other types of sports (have you ever seen a back flip done with a snowboard on a half-pipe?). The correct way is to be taught (and learn) is systematically and gradually. This applies to all sports in which anxiety may occur—combat sports, gymnastics, or whatever sport in which there is a risk of injury. Colin - scientific may be over stated, systematic is probably a better word. However the training methods being developed at places such as Kyung Hee and Yong In sports universities in Korea certainly use "Sports Science" in the same way Physical Therapists or even Personal Trainers are educated. ...Long ago, I learned that after the first contact, good or bad, my training takes over, then it's fun. That's been my experience as well. I find the best time to spar is towards the end of a class when everybody's warmed up; this assuages the butterflies. I believe that the fear stems from all of our imagined potential pain rather than from reality. Giving birth is supposedly the most naturally painful human experience of all. And not to show you up, but my wife gave birth to three boys without an anesthetic - she did it through conscious breathing and "focusing on a point in the room", which is also a meditation technique. That's good to hear. It sounds like you're in with a good group of people. Well said! Thanks for sharing your thoughts, Jill. There was a time when I would be semi-contact/full-contact sparring (sometimes up to 1.5 hours) about 4-5 times a week, in addition to 'lighter' martial arts training. Once you get used to that frequency, and your pain threshold increases, the butterflies really decrease drastically. I hear that - everything's relative. Most clubs don't train their people that way anymore. What I find is that most people really don't have an aversion to hard training, but rather the behavior of the other students and especially the instructor(s) - this is what really promotes fear and mistrust in sparring matches and other things. You bring up some good points. The best actually comes from your son. When he's sparring, he thinks about only 2 things: not getting hit and hit back. Forget the rest. I've seen some of those those snowboard stunts. I'll stick with karate! I'm not familiar with Tom Kurtz, but I will check out that link when I get a chance. Thanks for the info. And give away our chito-ryu secrets?? I rarely take a photo camera to the dojo - either forget or when I bring it in, I don't think about using it -. You get a routine on. I'll post pictures of what they look like. i have a student who no-one can touch in the dojo when sparring. he does triathlon and other iron man competitions yet when he fights in a tournament he's breathless after 30 seconds and doesn't want to fight on! anyone any ideas how he can overcome this crippling fear of losing/competitions? Your student's sense of anticipation on losing or looking bad is sapping him of all his strength. Actually, I'm wondering how he fares at these triathlon and iron-man events. When he's sparring in your dojo, there's no strings attached so to speak. That's the same perspective he needs to take when he goes out to compete. Remaining present while not being attached to the outcome is critical to performing well at any task. Hope this helps. Thanks for stopping by, NB.